The spray paving industry was introduced in Australia approximately 20 years ago and continues to grow at a staggering rate. The technology and application techniques have improved significantly over this period of time. Our product is a specially formulated coating system that adheres permanently to concrete giving the appearance of a newly laid decorative driveway, patio, pool surround or garage. 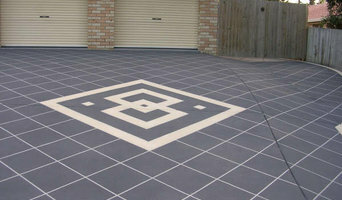 Spray paving as it is commonly known, has a wide range of applications in both the domestic and commercial sectors. About the Product... Will not peel or bubble — Solvent based paving paints trap moisture in the concrete. The trapped moisture can cause the paint to bubble and lift off. Our product will not lift off, as it is not paint. Spray pave products are a decorative resurfacing material for renovating old or new concrete surfaces — being a single pack polymer modified cementaceous coating system designed to give excellent protective durability, while decorating existing concrete in a vast range of styles, textures, colours and patterns. Slip resistant — Spray pave products are much safer to walk on in wet conditions than paving paint and other similar products as the product has an inbuilt textured finish for a more positive grip. Easy to clean — The spray pave coating system is protected by the application of a clear sealer, which is petrol and solvent resistant. Oil and stains simply wash away leaving your concrete looking like new. It is recommended to re-seal the decorative concrete once a year to enhance and refresh the overall finish. ¿Qué servicios ofrecen los expertos en pavimentos y muros de Toowoomba, QLD, AU? ¿Por qué contratar mamposteros y expertos en pavimento en Toowoomba, QLD, AU? Encuentra expertos en pavimentos y muros en Toowoomba, QLD, AU. Mejora los resultados de la búsqueda en la sección “Profesionales” incluyendo el nombre de tu ciudad o comunidad autónoma. También puedes consultar las fotos de proyectos de los profesionales de Toowoomba, QLD, AU para encontrar expertos que hayan trabajado en proyectos similares al tuyo.